Indian Education – Not scoring enough, are we? How do you feel looking at this picture? 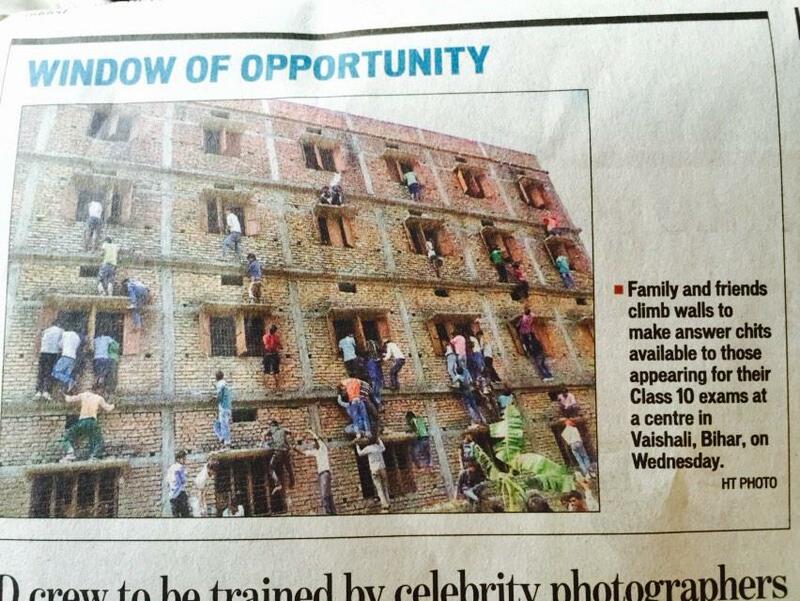 This picture was taken at an examination centre in Vaishali, Bihar. If you’re an Indian, you’re familiar with such kind of situations, some as extreme as this and some little less extreme. However, one thing very common during the months of March to May – when Pre-University examinations (10th and 12th grade examinations, commonly called as board exams) are held all over India – is the fact that organized attempts of cheating in the exams are commonly seen no matter what part of India we are in. Of course, it goes without saying that not all centres have this problem and not all students partake in this activity, but no one can deny that India has deeply rooted cultural problem of cheating in the exams. Indian education system – weather we want to accept it or not- is a total failure. India has the same British Raj era education system that is entirely examination-oriented, grade-obsessed system which completely focuses on the rote-memorization. Critical thinking is highly neglected in the Indian education system. In every subject, course and discipline, rote memorization is the most commonly used method. The examinations that are very easy to predict just by referring to the last couple of years’ examination papers, the syllabuses that aren’t revised or updated in years and the underpaid, passionless teachers are just few of the things that make it easy to adopt rote memorization based learning instead of critical thinking. Even in engineering, mathematics and other science streams people memorize entire theorems. Examinations are so predictive that students just refer to the papers from the past few years’ examinations and memorize the commonly appeared questions and answers. They are so used to this method of preparing for examinations that they also know what part of syllabus they need to memorize to get good enough grades since the examinations have options (alternative questions) and thus can omit major portion of the syllabus. This kind of memorization enables them to complete the examinations in time and they don’t even have to think while writing the examinations. This is the reason why you see a lot of noise when the examination format changes for the important examinations as student are so used to just memorizing for the examination and getting good grades that they are completely incapable of figuring out the new format of examination even though it’s based on the same syllabus and has the same kind of questions that they are taught in class. Most of the colleges (engineering, science, medical) have professors that just dictate notes to the student and these notes are nothing else but the answers to the questions that are common in exam papers. Plagiarism is a concept that is completely alien to the Indian students and in the lack of critical thinking there is minimal emphasis on the original work and research in schools. Schools are also known to influence the output of practical exams as most of the students don’t even bother to learn practical applications of the theory. In almost all classes of society, the main object of education is to get good grades. Lower class and rural area students just want to get good enough grades that helps them achieve graduation certificate and for that they cheat, threaten / beat / harass invigilators that stop them cheating. Not only that, sometimes they force the invigilators to bring cheat sheets in the examination room, let them use cell phones or just allow them to copy from other students. The so called urban upper class is not very different. Their main objective is not to get passing grades but to get very high grades since with the kind of population India has, and since the high-demand streams like engineering and medicines have limited seats and the competition based on the grades is very high. Students in this social class are under tremendous pressure. They work so hard with school classes, tutoring classes and home work that they often burn out and once they get in the schools of their choices they get so relaxed they don’t learn anything. The complete lack of learning in Indian universities is the by-product of the fact that Indian universities are just the brand and they are seen as the ticket to jobs. Critical thinking, learning, etc. are some of the things that are completely irrelevant in such universities. After independence, India focused more on tertiary education instead of primary education which resulted in a few excellent universities such as the Indian Institutes of Technology (IITs) and Indian Institutes of Management (IIMs) that produced highly skilled engineers and PhDs. However, the focus on higher education was achieved at a cost of negligence in primary education. Government’s failing to provide decent primary education helped the growth of private sector education so much that by 2005 one in five students of this country was taught by private schools. India has started recognizing this problem. UPA government in 2012 allotted $10 billion for the education which was more than double of the $4.2 billion allotted budget of 2005. The same UPA government rolled out Right to Education (RTE) Act in 2009 that was meant to give every Indian child a quality education. The RTE law mandates 25 percent admission reserved in private schools for “disadvantaged” and EWS (economically weaker section) students who are too poor to afford expensive private schools. However, even though RTE emphasis on equal learning opportunity for less fortunate students and making sure that schools have resource inputs like boundary walls and outdoor playgrounds, it decreases accountability for learning by decreeing that students can’t fail and scrapping a national examination for tenth- grade students. The main problem is not the enrollment of students as India has 96.7 percent enrollment rate. The main issue that RTI fails to address is the absenteeism of teachers and students. 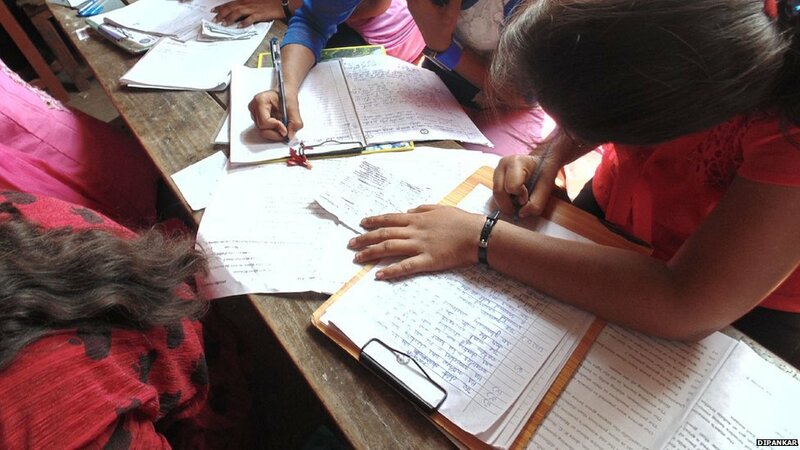 According to Pratham, teachers are present in the class less than 80 percent of the required hours and students attend less than 50 percent of the required class. In a nutshell, what India needs is a complete reform in education system that emphasis on critical thinking, learning and application of the knowledge rather than rote memorization based exam centric system. Such reforms are very difficult to achieve and can’t be done in short time period but It’s about the time India thinks, discusses and implements such changes.